The Great Trossachs Forest National Nature Reserve is about creating a large-scale forest for the benefit of wildlife and people. Equal in size to Glasgow, The Great Trossachs Forest NNR is one of the most significant woodland regeneration projects to take place in the UK for a generation. The partners have a shared vision for the area. Imagine a spectacular landscape, stretching from loch shore, through pasture and wooded glens to open moorland, with high peaks in the far distance. At the woodland edge, black grouse display on a Spring dawn. Cattle graze among the trees and butterflies frequent the plentiful wildflowers. An eagle soars high above the mountains. The Great Trossachs Forest project was launched in 2009 by the Scottish Forest Alliance. Global energy company BP invested £10m in native woodland restoration at 14 sites across Scotland since 2000 through this Alliance. Loch Katrine is Glasgow’s main water supply, providing 70% of the water used by Glasgow’s inhabitants. The supply became contaminated by a bacterium potentially carried and subsequently excreted by sheep which were grazing on the Loch shores in 2002. After that farming was stopped, and Forestry Commission Scotland began managing the land for biodiversity and conservation purposes. The members of the Alliance, who own adjoining sites across the area, saw a chance to work together at a landscape scale for the first time. 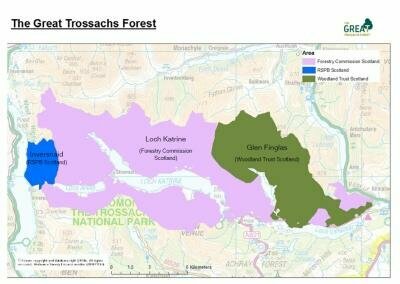 The landholdings of Forestry Commission Scotland, RSPB Scotland and Woodland Trust Scotland together make up The Great Trossachs Forest. Scotland is blessed with many different types of native woodland, each with its own character. The nature of the woodland depends on the altitude, climate and soil conditions. Within The Great Trossachs Forest NNR we have a rare opportunity to create a landscape-scale forest which includes a range of woodland types at a variety of densities. This offers significant benefits as the mosaic of habitats can expand and contract naturally over time. This means that the ecosystem is not constrained by other land uses and offers better conditions for wildlife to thrive. Management of the forest will also improve and secure the water quality in Loch Katrine, which is Glasgow’s main water supply. The Great Trossachs Forest project main aim is to create a forest landscape large enough to include a range of habitats and a diversity of wildlife. The project will create around 4,400 hectares (44km2) of native woodland. It will create an area of 16,650 hectares (166km2) of forest and open ground containing a mix of habitats, returning ecosystems which have been damaged by over-grazing and human exploitation to a more natural state. Climate change is altering the natural balance, restricting the areas which are suitable for many native species of birds, insects and plants. Creating large areas of high quality habitat like this helps these species to adapt in the face of climate change. The new forest balances the needs of wildlife and people. The restored landscape offers superb recreation: a range of walks, cycle paths and guided trails for people of varying abilities and fitness. The forest celebrates the rich and diverse culture which has influenced this landscape and inspired generations of artists and writers. The area offers excellent opportunities for outdoor learning and education packs have been developed to support visits by school groups. We actively encourage ecological research on the sites. Find out more information about ongoing research. The Great Trossachs Forest is the result of a unique collaboration between energy company BP, Forestry Commission Scotland, RSPB Scotland and Woodland Trust Scotland. By working together through the Scottish Forest Alliance and with other partners we will help wildlife to adapt to climate change and demonstrate what partnership can achieve. The stunning landscape of the Trossachs has inspired countless artists. Understand the history which resulted in Loch Katrine becoming Glasgow's primary water supply. A short film about restoring native woodland in the Great Trossachs Forest.